Best Truly Waterproof lightweight Dry Bags (relatively durable)–Sea to Summit Lightweight Drysacks? Home › Forums › Gear Forums › Gear (General) › Best Truly Waterproof lightweight Dry Bags (relatively durable)–Sea to Summit Lightweight Drysacks? What is the lightest truly waterproof and relatively durable dry bags out there? I am looking at the best way to waterproof items in my pack. Right now I am using and having the best success with the Sea to Summit eVAC drysacks. They have 10,000mm waterhead nylon with an EVENT bottom. I used them for a month of backpacking/rafting with no leaks (July) so far. They are very lightweight. However, the annoying thing about them and why I am looking for an alternative is that they are more bulky than most drybags. After I expel air through the EVENT bottom, a couple hours later it fills up with air. Therefore, regular dry sacks without a means to expel air are actually less bulky for me. I'd love these drysacks if they did not have the EVENT bottom. I have tried silnylon (sea to summit silnylon 1200mm waterhead), but I found that under actual use (the way I often use them) that they frequently "wetted out" and everything eventually gets moist (no massive leaks). My backpacking often involves extremely wet conditions like on backpacking/packrafting trips or hikes that involve a lot of water crossings or swimming where things are wet for a while. Therefore, I was looking into trying the Sea to Summit "Lightweight Dry Sacks". Anyone use them? They seem plenty light and it would be great if they used the same material which is used on the majority of the EVAC dry sacks, but I can't figure out much info on the material. I have also had great experience with the Sea To Summit "Big River Dry Bags", but in the larger sizes I'd only rather use them for kayaking and rafting and not backpacking because they are heavy. For Backpacking I just use a mini one to hold my first aid kit and camcorder. Before going to dry bags I used ZipLock bags that I protected from abrasion by lightweight nylon stuff sacks. This worked well, but a couple years ago I started feeling bad about all of the waste, since on a big trip I always used new bags. I also don't think cuben would be a good option b/c of durability and expense. I can hope others have a better solution. I would prefer to carry one "good" waterproof dry sack which may weigh a bit more than carry several drysacks that are lighter but may not be as water-resistant. I have tried the Granite Gear eVent sacks but in my minimal testing they will fail the Jim Wood test. I like the eVac bags (which have not failed the Jim Wood test) and would prefer to use one of them for my dry gear and use a simple plastic bag for the rest if needed. The eVac bag will last me quite awhile, so there is a cost saving advantage as well. 1) A 3L SS Big River Bag for my First Aid kid Kit and camcorder if it rains. 2) SS eVAC 20L for clean stuff (clothes and sleeping bag). 3) SS eVAC 35L for Tent and food in an Ursack with a LOKSAK. The issue is that it sometimes becomes more challenging to put stuff back in my pack that I have used or worn because the eVACs gradually blow up on their own, so I often also have to expel the air out of one of the eVAC dry bags by unbuckling one or just taking the bag out in order to expel the air by pushing on it. So far it sounds like the SS eVACs may be the best option right now for light and truly waterproof coverage. I find that my evac sacs are so compressed in my pack that they do not "inhale" until they are removed. But admittedly if they have room to breathe they will. It depends on your needs, I would only use one for dry gear, sleeping bags etc. for food and shelter it is less important. I use an ul exped bag for the camera, inside a zpacks multipack. These comments are very helpful. I do a fair bit of mixed kayakingcanoeing and hiking trips and recently bought a bunch of SeatoSummit cordura and nano sylnylon bags this summer. While they are very light and reasonably waterproof, almost all suffered a hole or tear. They work better for soft non-edgy gear such as clothes, etc. The edges of harder surfaces does wear through. I won't be buying anymore of them as the reduction of in weight is pointless if the material doesn't last. But based on these posts I will try the eVacs. Don't know if these were mentioned yet, but all sizes are under 0.75oz. Ken, those GG eVent dry sacks look interesting. I hope my local REI carries them, so I can see if they "feel" tough enough since they sound so thin. Is "Cubic Tech" some kind of cubin fiber? I wonder how durable it is? Cubic Tech is the company that makes cuben fiber. +1 for the granite gear bags that KJ posted the link to at REI. They come in different sizes, so you may want to check and see if any are right for the gear you're storing. eVAC and eVent® Compression sacks are basically the same. One has a compression harness, one does not. The Granite Gear Uberlite bags do not come in a compression variety. All three do the job keeping things dry. I have had my eVent for about three seasons with no discernable water problems, even in an open topped canoe in two days of rain. I have no long term reports or experience with GG's cuben bags. Bothe are available in the sizes I need, about 10L. Lighter Cordura bags don't seem to hold up as well for my use. Cordura makes good tarps, but it usually fails to make good dry bags. Too many items in the pack are odd shaped: pot, stakes, buckles, etc. They don't take abrasion well, but they DO work well for about a week. If you are searhing for the lightest weight bags, these are the ticket. But be prepared to purchase a new one for each trip. Seams stretch, fabric can stretch, and, thay can be easily punctured, example: by a stray stake. I bought a set of three that all leaked after a single week, but not the first or second day, usually. I simply seal them with a mineral spirits/silicone calk mix and they hold up better. But, I loose the weight advantage after the third application. I use these as my food bag usually, knowing my food is usually in ziplocks. I used to carry seperate bags for ease in stuffing into stow wells of kayak. The pack was often rolled up and stuffed in the back with various pieces of gear in it (fuel, stove, pot, cover, wind screen, flashlight, bear line, etc…) At a long portage, I will simply drop the bags into the pack, put the wheels on and go. But it has been over 20 years since I was out in a kayak. 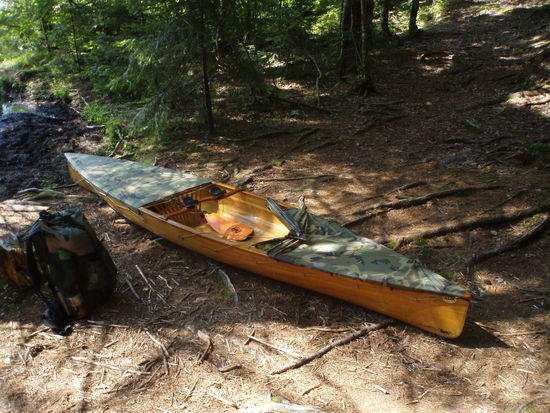 Mostly I use a smaller 12'6" or 13'8" stripper canoeyak. The pack, I leave loaded, behind me, under the rear spray-deck. Here is a picture from the St. Regis Area in late July. As you can see, there is only the canoe & gear that is different. I had 2 bags with me but the food bag was down to about 5-6 pounds by then. Using the pack prevents a lot of wear on the bags, too.